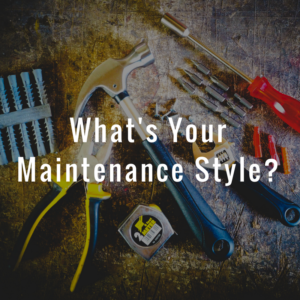 Reactive, Preventative, & Predictive: Finding The Best Maintenance Style For You - Facility Health Inc. Maintenance is an absolute must at your facility so why does it feel like a chore? We’re guessing it’s because you’re using an ineffective strategy. At it’s core, maintenance may seem very simple, but there are several different ways to approach it. From reactive maintenance to preventive and predictive–each has its own pros and cons, savings and costs. So how do they affect your facility? This is usually the type of maintenance most people are familiar with. If something’s broken, you fix it. If a sink is leaking, you stop the leak. If equipment is malfunctioning, you lug out the manuals, troubleshoot, and replace the shot pieces. While this style is definitely the best at addressing emergency situations–and getting financial approval in the blink of an eye–it also has some glaring problems. At the top of the list are increased cost and inefficiency. Emergency situations demands a lot of attention. It needs funds immediately. There’s equipment to replace, loss of productivity with the subsequent downtime, and increased labor costs. Can you say ‘hello, overtime pay’? Overall, this is a low cost option until something breaks. And something will break. Preventative Maintenance is a step above reactive. It definitely requires more planning, but the small, periodic steps taken to look after equipment can drastically change the way they perform. Think of preventative maintenance like changing the oil in your car. Keeping a regular schedule for this will prolong the life of your car and help the engine run more efficiently. If you don’t change it, the car will eventually break, but you don’t know when. Maybe you have preventative maintenance schedules in place. How disciplined are you at performing those tasks? How effective is that discipline? Not very. That’s the biggest disadvantage of preventative maintenance. Despite the energy savings and long-term reduced costs, emergencies will still happen. When they do, you’ll be right back to square one with the other guys who rely on reactive maintenance. Predictive Maintenance is the gold standard. Out of the three styles, this has the most advantages including decreased costs for parts and labor and better quality products. Cost savings can be 8-12% higher than preventative maintenance programs. By looking ahead, it allows for improved safety, preemptive corrective actions, and increased operational life for equipment. So why doesn’t everyone use predictive maintenance? The simple answer? It’s harder. Most facilities don’t have the means or the will to do it. It means investing in diagnostic equipment and staff training–both of which can be hard to squeeze out of the budget. It’s also tricky for management to recognize the savings potential when they’re used to only dealing with emergencies. At Facility Health, we rely on data to help you engineer a new, more efficient and low-cost system. We can use records from reactive and preventative maintenance styles and combine it with our Dynamic Facility Condition Assessment (FAC) to help you create an optimized predictive maintenance strategy. We know adopting a predictive maintenance strategy will create a complete cultural shift in your facility. Take away the chaotic reactive maintenance and the lax preventative measures to gain a highly-skilled, efficient, happy facility. Contact us now to learn more about predictive maintenance and how it can change your facility for good.